As we saw in part one of this post, the May 20th edition of the BBC Radio Ulster “religious and ethical news” programme ‘Sunday Sequence‘ included a long item (from 34:04 here and also aired on BBC Radio Foyle) supposedly about the state of the ‘peace process’ after the May 14th chapter of the ‘Great Return March’ publicity stunt on the border between the Gaza Strip and Israel. Mason’s response [from 39:13] included the predictable – yet invalid – claim that it is possible to use the Good Friday Agreement as a template for solving the Palestinian-Israeli conflict. Picking up on Mason’s reference to “the role of civic society” in peacemaking, Julie Norman then inaccurately claimed that violent actions such as the ‘Great Return March’ or the rioting in Bili’in are grassroots peace initiatives. Following some reminiscing from Clonan about the Irish peace process, McAuley revisited his BDS messaging while again promoting her own pet ‘most important thing in the world’ theme. What all that has to do with the item’s professed subject matter is of course as clear as mud. McAuley however chose to continue the ‘youth bulge’ theme. While acknowledging a “very high youth demographic in Palestine“, Norman responded that she would not equate that with destabilisation. The fact that Israel disengaged from the Gaza Strip 13 years ago of course did not get a mention at all in this entire item. Again ignoring the Israeli disengagement from the Gaza Strip and parts of Samaria in 2005, Mason went on to say that Israelis “may have to give up land for peace […] and we just need, I think, to bring that concept into it…”. Listeners were next treated to Mason’s home-grown psychological analysis of “the Israelis”. Notably, no-one in the studio bothered to question Clonan’s omission of Hamas from his list of those guilty of “patriarchal thought”. Where those tanks had supposedly been driven from was not clarified to listeners before Clonan jumped in with a plug for yet another political NGO. Clearly this long item cannot possibly have contributed to audience understanding of the professed story and its context, riddled as it was with gross inaccuracies, deliberate distortions and important omissions – and not least the important issue of Hamas terrorism. The repeated inappropriate comparisons to the Northern Ireland conflict likewise detracted from listeners’ understanding of the background to the topic supposedly under discussion and the one-sided claims and comments from contributors and presenter alike – including promotion of the anti-Israel BDS campaign – are ample evidence that the prime aim of this item was to promote a specific political narrative. 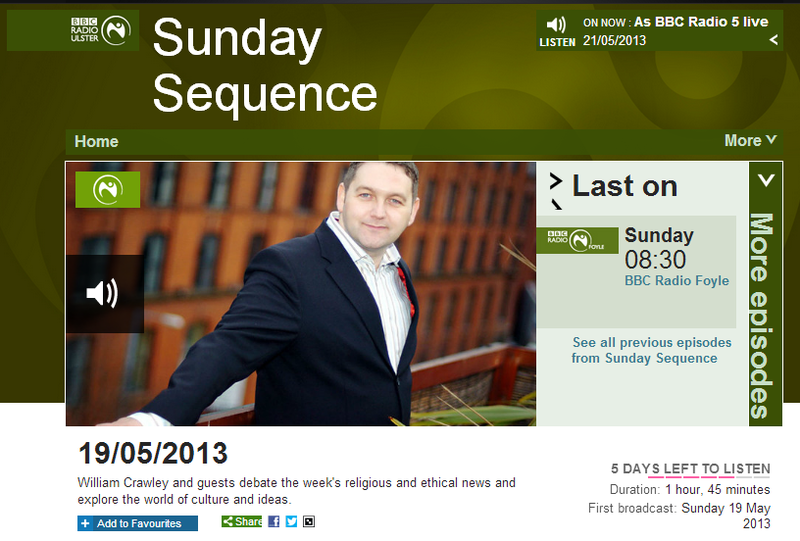 While we have seen some problematic programmes relating to Israel on BBC Radio Ulster in the past, the May 20th edition of the station’s “religious and ethical news” programme ‘Sunday Sequence‘ included a long item (from 34:04 here and also aired on BBC Radio Foyle) which was even more remarkable than usual – not least because one contributor managed to shoehorn the Eurovision Song Contest, the 9/11 terror attacks, BDS, Salisbury and Iranian youth unemployment into the discussion. Four days before this programme went on air a Hamas official had announced that fifty of those killed during the ‘Great Return March’ rioting on May 14th were members of Hamas. Prior to that, the Palestinian Islamic Jihad had claimed three of the dead. Information available to the public had already shown that some 80% of those killed since the pre-planned rioting began at the end of March were members of various terror factions in the Gaza Strip. None of that information was communicated to listeners in presenter Roisin McAuley’s introduction to the item, or indeed in the rest of the broadcast. Listeners did, however, repeatedly hear the use of the term ‘Palestine’ – despite the fact that the BBC Academy’s “journalists’ guide to facts and terminology” states “in day-to-day coverage of the Middle East you should not affix the name ‘Palestine’ to Gaza or the West Bank”. With Tom Clonan having told his Lebanon stories to the media many times before, there can be no doubt that when the producers of this programme decided to invite Tom Clonan to participate, they knew exactly what listeners were going to hear next – and what not. Absent from Clonan’s portrayal of a ‘massacre’ is the fact that Hizballah terrorists had fired missiles from the vicinity of the UN post at Qana, the fact that the UNIFIL personnel there had made no attempt to stop that repeated fire despite the fact that civilians were sheltering in their post and the fact that the deaths of the civilians was completely unintentional. After BBC Radio Ulster audiences had essentially been told that the 9/11 terror attacks were Israel’s fault, Clonan continued, equating Israel with the Syrian dictator who uses chemical weapons against his own civilian population and presenting a highly debatable portrayal of the laws of armed conflict. Making no effort to clarify to listeners that the casualty figures quoted and promoted by Clonan are sourced from the terror group that initiated, facilitated and organised the violence, McAuley then gave credence to his 9/11 allegations while inflating the significance of a conflict that is way down the list of the current major conflicts in the world. Norman’s response [from 37:57] deliberately erased the fact that over 80% of those killed during the Gaza border rioting since March 30th were linked to terror groups. Revealingly, neither Norman nor any of the other participants made any effort to clarify at point or later on in the item that those so-called ‘protests’ have included shooting attacks, IED attacks, firebomb attacks and infiltrations and attempted infiltrations of the border fence. The second part of this post will address the rest of the item. Unsurprisingly, that inaccurate claim continues to appear in BBC content from time to time and last year a BBC department rejected criticism of its description of the Western Wall as part of the Temple in a video for schools. In fact – as the BBC has previously accurately reported – the missing tourist was last known to be in southern Israel. Unfortunately for listeners to this BBC religious affairs programme, however, that ‘education’ once again included promotion of the inaccurate notion that the Western Wall is part of the Temple that was destroyed in 70CE. When George Galloway promotes Assad regime propaganda on Iran’s Press TV or the Iranian/Syrian funded Beirut-based Al Mayadeen TV, most of us are probably not in the least bit surprised that media outlets beholden to totalitarian regimes make no effort whatsoever to conceal their conscripted status. However, we reassure ourselves that such blatant and unabashed amplification of the baseless lies and propaganda of a vicious dictatorship could not happen in Western countries where reliable and reputable broadcasters operate according to clearly defined editorial standards. Or could it? We recently witnessed one instance in which the BBC ran a headline (later amended) composed of pure, unadulterated Assad propaganda. On Sunday, May 19th 2013 BBC Radio Ulster’s ‘Sunday Sequence’ programme – which claims to “explore the week’s religious and ethical news and examine the key debates from the worlds of culture and ideas” with host William Crawley – permitted a long segment of the show to be devoted to running interference for the Assad regime, together with the promotion of anti-Israel conspiracies and tropes of an antisemitic nature. 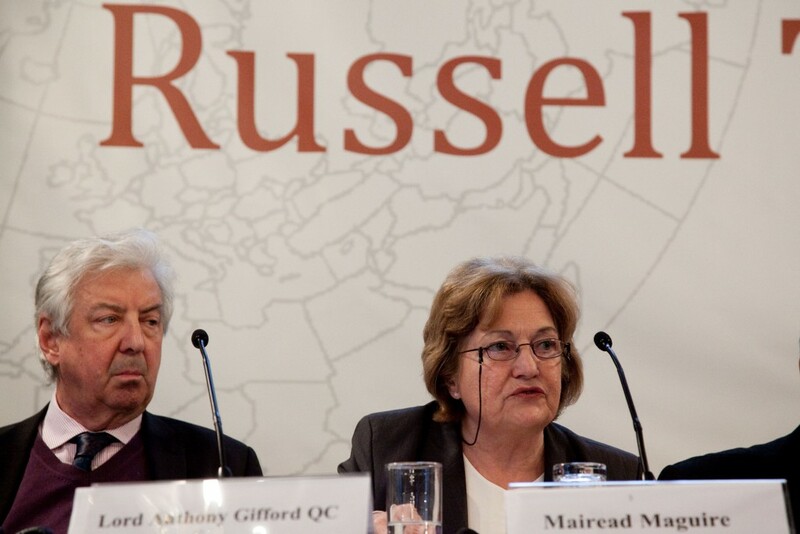 The programme’s guest who was provided with a BBC platform from which to engage in that diatribe was prolific anti-Israel campaigner, Vanunu fan, ‘Global March to Jerusalem‘ supporter, ‘Russell Tribunal on Palestine’ “jury” member and former flotilla passenger Mairead Maguire. Host William Crawley – apparently rather over-awed by her status as a 1976 Nobel Peace Prize winner – refrained from informing listeners about Maguire’s rich history of anti-Israel activity before allowing her to launch into her largely unhindered propaganda rant. That is followed at 11:19 by Maguire’s ‘explanation’ of the ‘reasons’ behind potential Western intervention in the Syrian civil war. Of course neither Maguire nor Crawley bother to inform listeners that the Assad dynasty’s supposed “defence of the rights of the Palestinian people” has never extended to Palestinians living in Syria. “Between 70 and 90 thousand refugees arrived in Syria, the majority from Tzfat, Haifa, Tiberias and Acco. In 1954 they were awarded partial rights, which did not include political rights. Until 1968 they were forbidden to hold property. Syrian law allows any Arab to obtain Syrian citizenship as long as his permanent residence is in Syria and he is capable of supporting himself economically. But the Palestinians are the only ones excluded from the terms this law. Even if they are permanent residents and affluent, the law prevents them from receiving citizenship. “Well you see when we were in Syria, Israel attacked Syria. Two planes over Syria. The programme continues with what is presumably supposed to be a ‘balancing’ phone interview with Professor Beverly Milton-Edwards, which will do little to correct the perverted impressions listeners have already received from Maguire – not least because of its dismal sound quality and the fact that it lasts far less than half the time which she was allocated. The Assad regime and its Iranian backers will no doubt be very impressed with the latest BBC voluntary contribution to the cause of spreading classic Syrian dictatorship propaganda – although the MP for Bradford West might be somewhat put out at no longer being the only star of the Assad makeover show. Real journalists – particularly publicly funded ones bound by standards of accuracy and impartiality – should, however, know better.